For the first time in recent history, the Grizzly Scholarship Association’s (GSA) annual spring tour of the Treasure State will include a stop in the Magic City, giving Billings residents the chance to mix and mingle with Griz coaches and staff. With the addition of Billings to the schedule, the 2017 Grizzly convoy is set to make 14 stops around the state, logging over 3,000 miles while visiting local GSA chapters and spreading the good word of Grizzly athletics from border to border. Over the course of five weeks from mid-May to early June, GSA chapters from Hamilton to Sidney and beyond will roll out the welcome mat with barbecues, golf outings, and socials. Grizzly Athletics representatives set to travel the state include athletic director Kent Haslam, head football coach Bob Stitt, head men’s and women’s basketball coaches Travis DeCuire and Shannon Schweyen, just to name a few. “The GSA Spring Tour is an awesome time of year,” said senior associate AD, and GSA executive director Greg Sundberg. The annual loop of the state kicks off next Friday, May 12, as the caravan heads north to Big Fork for the Grizzly Golf Classic at Eagle Bend Golf Course, before heading east of the divide to Lewistown, Great Falls, Cut Bank, Fort Benton, and Ronan the following week, May 15-19. May 23-25 will see the Grizzly road show heads to the Hi-Line with stops in Glasgow and Sidney before making a return to Billings. The Billings GSA chapter will host a barbecue and social at the Red Lion Hotel and Convention Center with appearances from Stitt, DeCuire, and Schweyen, as well as Grizzly soccer coach Mark Plakorus, volleyball coach Allison Lawrence, golf coach Matt Higgins and softball coach Jamie Pinkerton. 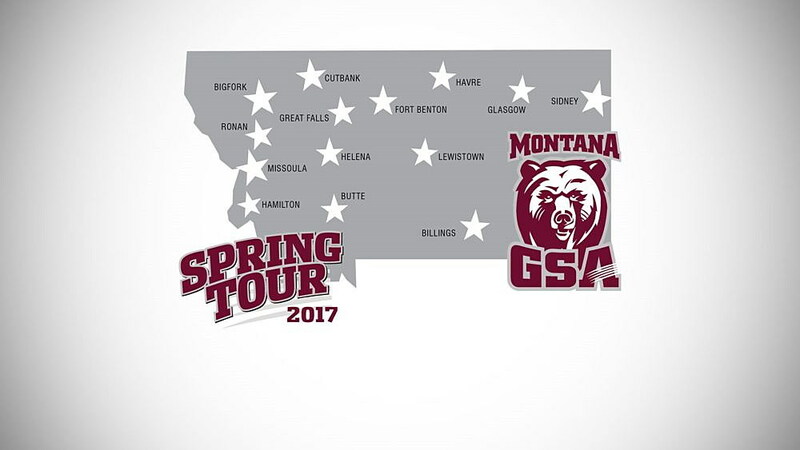 This year, Grizzly Athletics will provide extensive coverage of the GSA Spring Tour on GoGriz.com, on Twitter @UMGRIZZLIES and Facebook as well. Register early, this event has sold out in previous years.